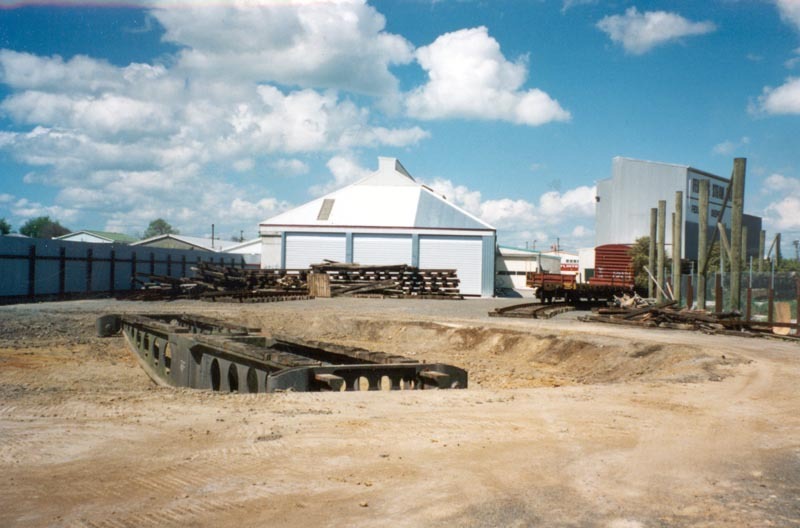 After months of looking and negotation, we secured the purchase of the old Palmerston turntable in the South Island. 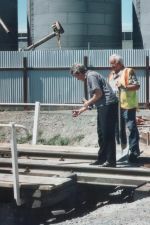 Once the sale was confirmed our chairman drove to the South Island and organised for the turntable to be delivered to Feilding. Tranz Rail picked up the turntable from Palmerston on Saturday and delivered it to Feilding on Monday the 17th of September 2001 - a journey of less than 48 hours. 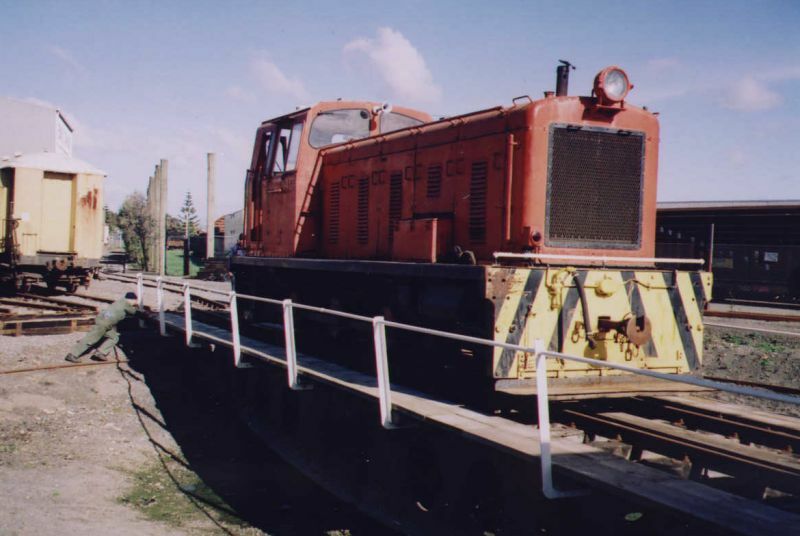 The turntable was designed and built by New Zealand Government Railways in 1903 and initially located at Palmerston (South Island) as a 55 foot standard turntable. It was subsequently extended to 62 feet in 1940 to accommodate the (then) new Ja class of longer and more powerful tender locomotive. 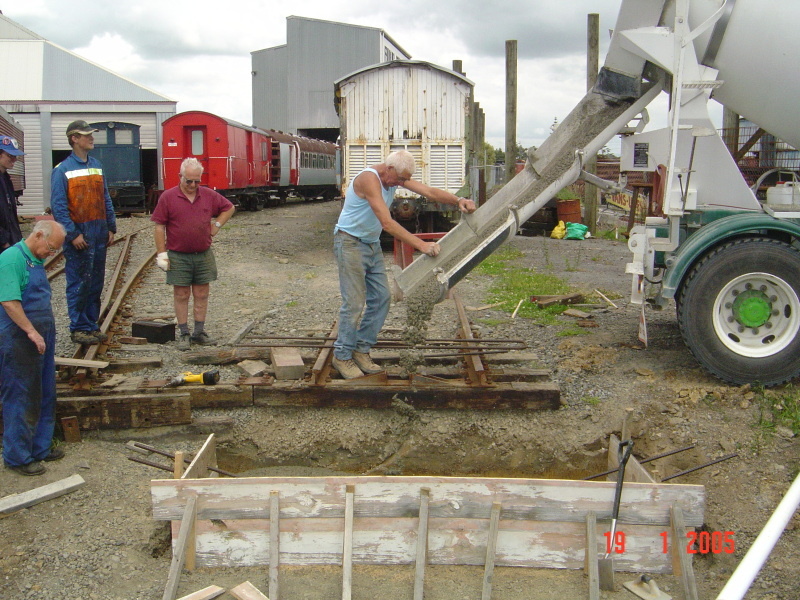 Pouring the concrete to give the locos a sturdy entry/exit from the turntable. The DSA is often on the turntable as part of its shunting duties. Audrey Severinson and Russell Wiseman, cutting the ribbon and declaring the turntable open. 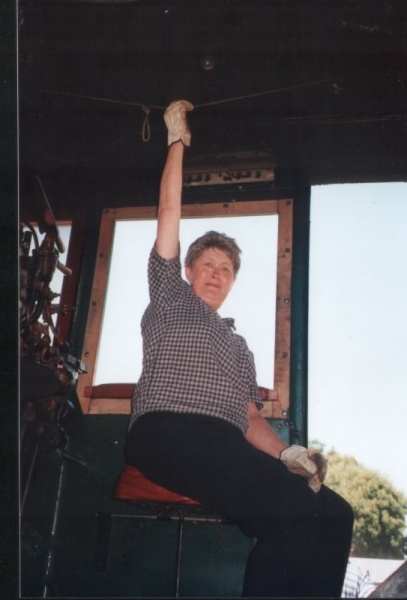 Audrey Severinson, Feilding's Mayor, officially opened the Turntable by blowing the Wab's whistle. One of the last jobs to do was to lay the board walk and attach the hand rails. 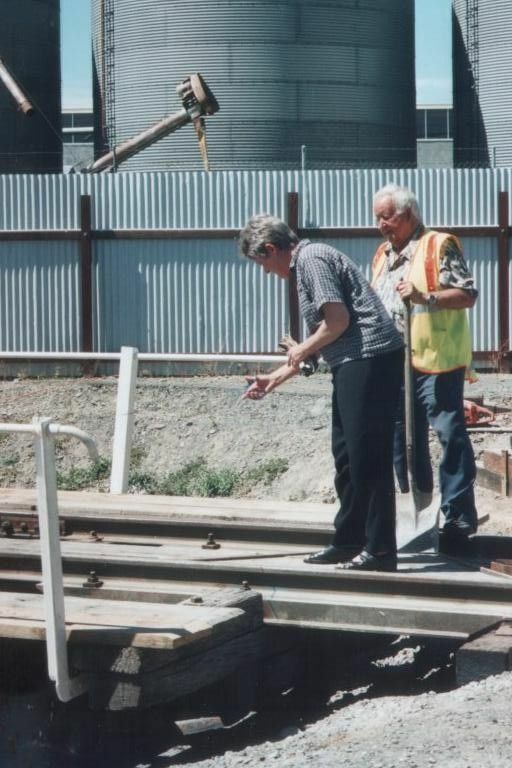 Mike Barnes and Kevin think through the job at hand. 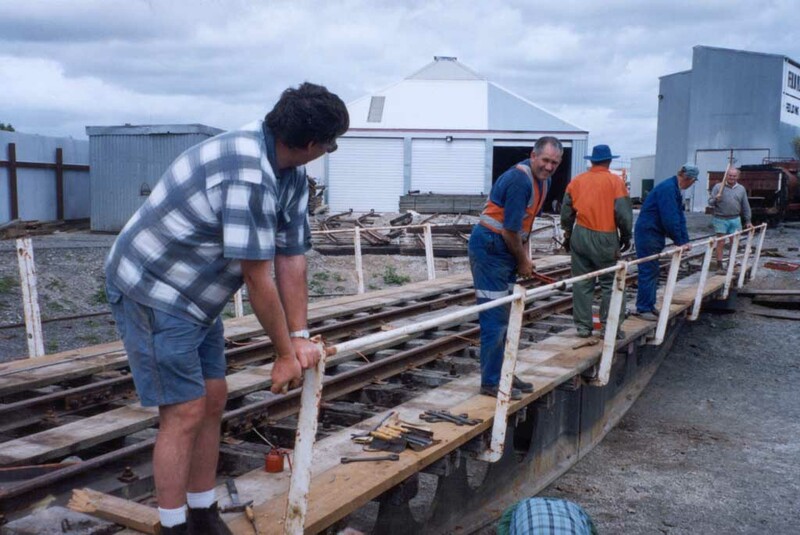 The rail was put on the turntable and bolted down. Graham is in there doing the dirty work. 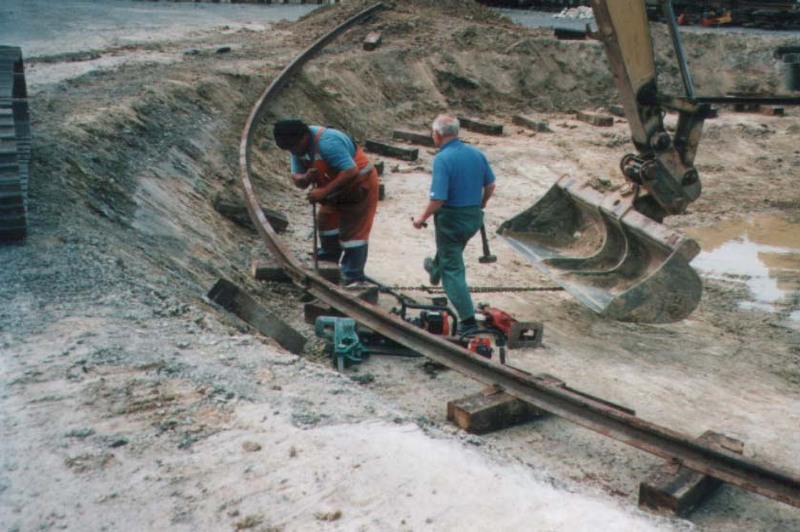 Jack and Larry used the jack to bend the ring rail into a circle. 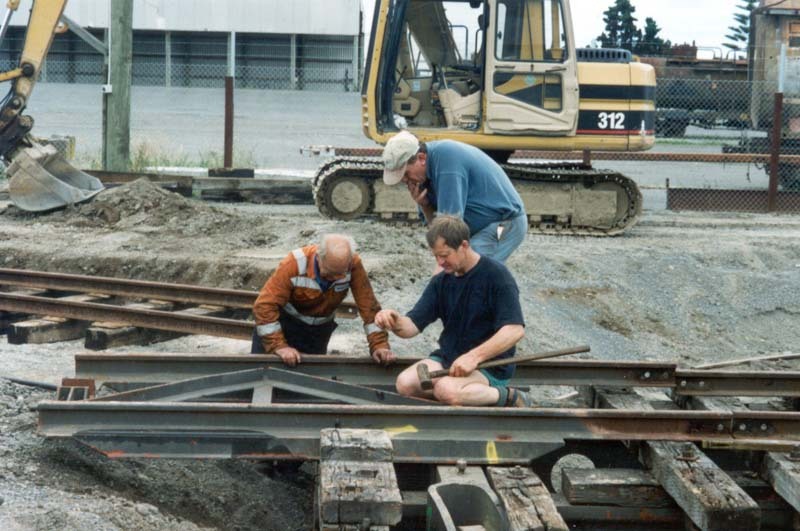 Jack and Larry worked together for three weekends to fit the ring rail. 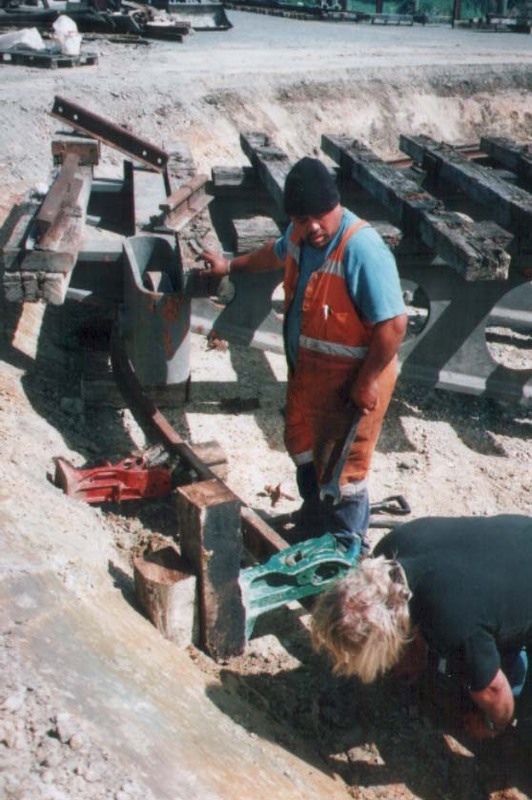 The old Palmerston ring rail was badly rusted so it was decided to make a new one. This took a lot of work but will last for years. 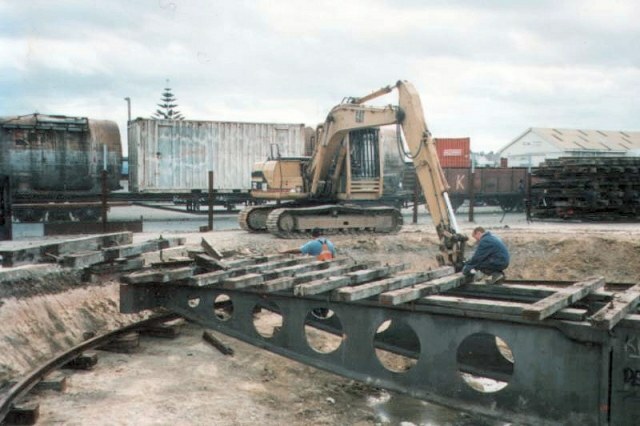 The turntable in the ground. 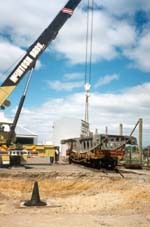 Lowering the turnable into the pit. 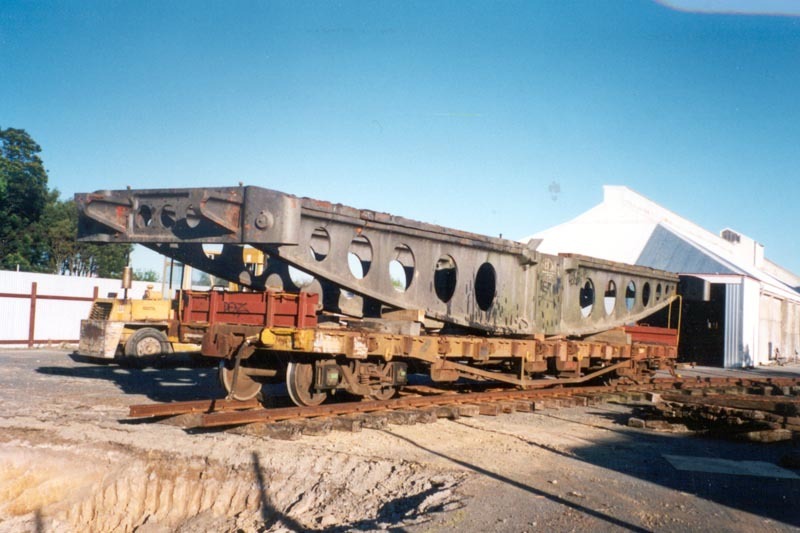 The crane lifted the turntable off the wagon and placed it on the centre. 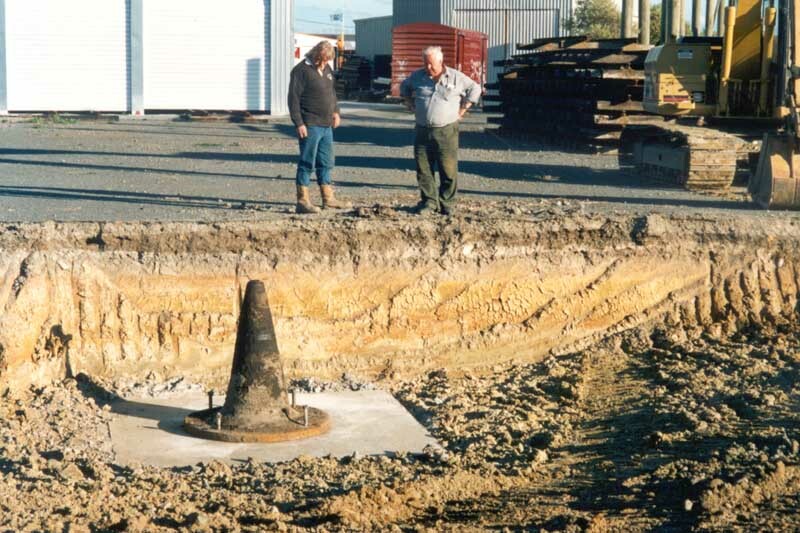 The Centre has been placed on the concrete pad. The bolts are still to be done up. 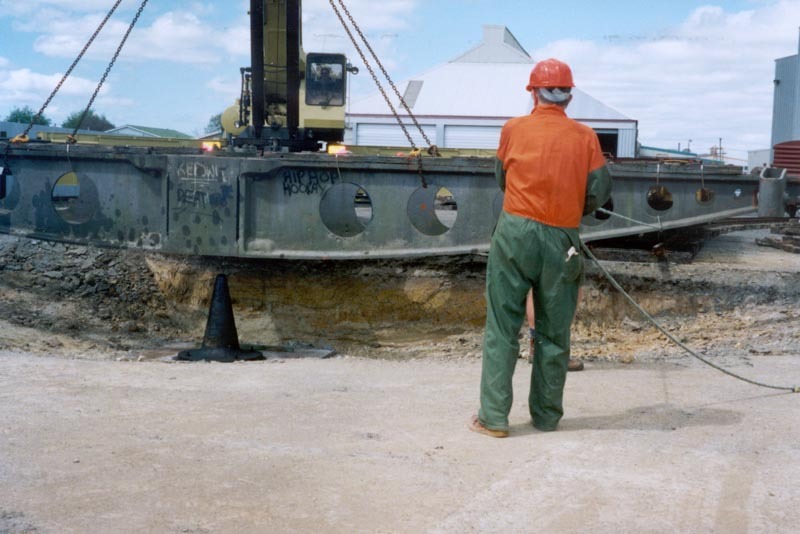 The turntable was pushed up next to the hole in the ground ready for the crane to lift it into place. 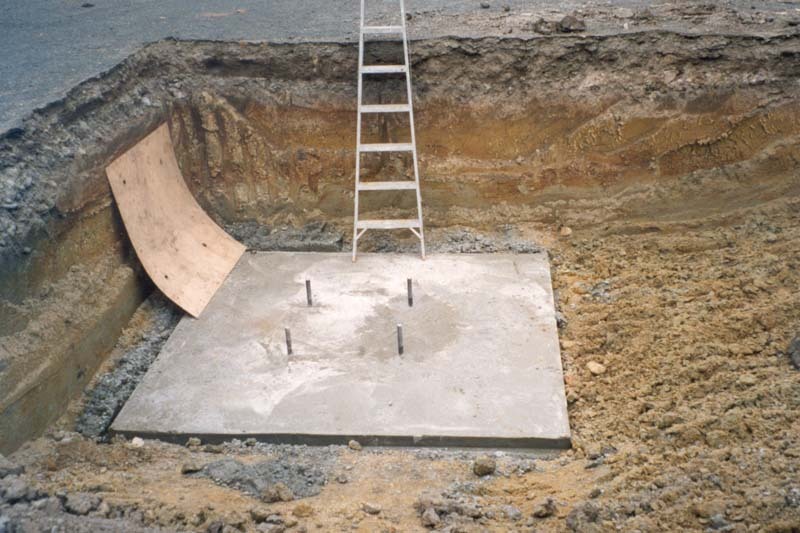 The concrete pad after the boxing was removed. 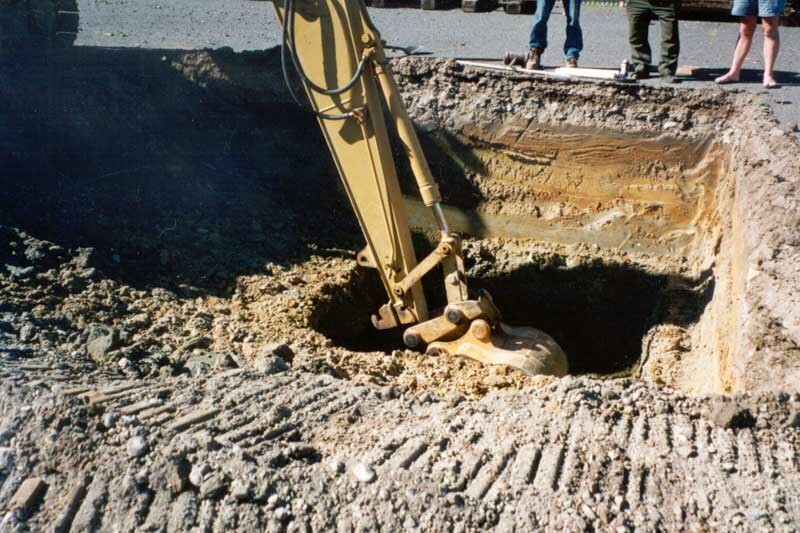 Five tonnes of concrete went into this hole. 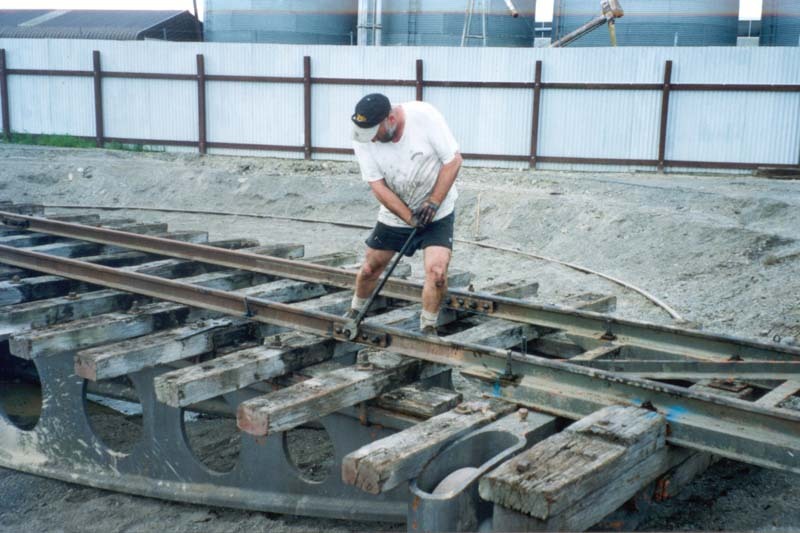 While the concrete was drying we cleaned the bearings out of the turntable. Once cleaned we then installed them back into the turntable with new grease. The reinforcing steel was tied to the bolts and placed in the new hole ready for the concrete. 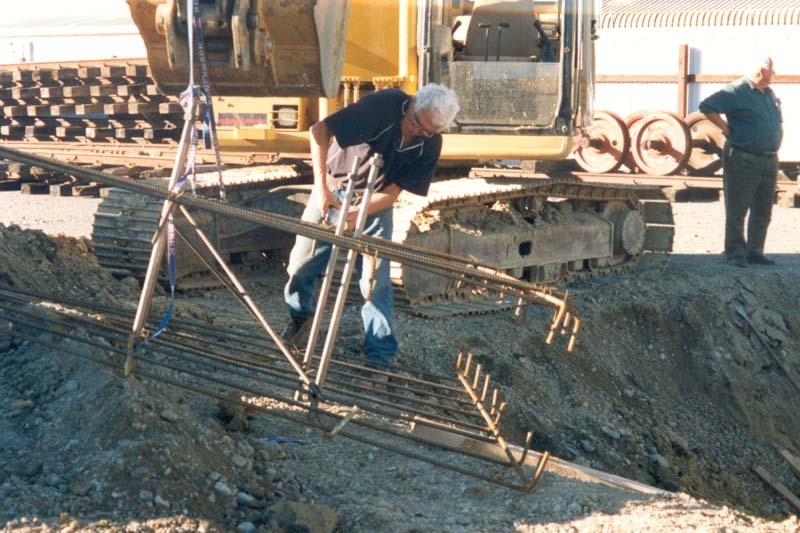 The digger dug a deep hole in the ground for the concrete base to go in.